Jarrow Roofing drew 2-2 at home to Bishop Auckland last night despite taking the lead inside a minute. Kerry Hedley opened the scoring on 58 seconds after Shaun Vipond played a ball through midfield and met the on-rushing frontman following a good run, allowing for a low finish past the goalkeeper. And the perfect start continued when Paul Chow doubled the advantage in the seventh minute after James Fairley advanced down the right and floated a ball in for the Northern League legend to head home. Roofing dominated the first half, although Bishops showed signs of recovery towards the end. The second half was a much more entertaining affair and Bishops got their first on 55 minutes as Dan Regan’s clearance was met by Andrew Johnson who returned the ball by looping the keeper and nestling into the back of the net. And on 80 minutes came the equaliser as Johnson got a deserved second following a cross from the right which he headed past Regan. Roofing travel to Newcastle Benfield in the league on Saturday. Meanwhile, Hebburn Town are in action tonight when they they host Birtley Town in a Northern League Division Two clash. 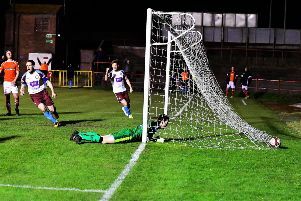 Chris Smith – the hero on Saturday after his last-gasp winner against Chester-le-Street – misses the game through work while manager Scott Oliver has injury doubts over Kris Summers (thigh), Ian Bickerstaff (quad), Glen Hargrave (broken nose) and Channon North (groin) for the visit of one of his former clubs.